Welcome back to Toy Aisle, which after a post-Toy Fair break, is back and ready to tempt your wallet with all sorts of lavish toys and collectibles. 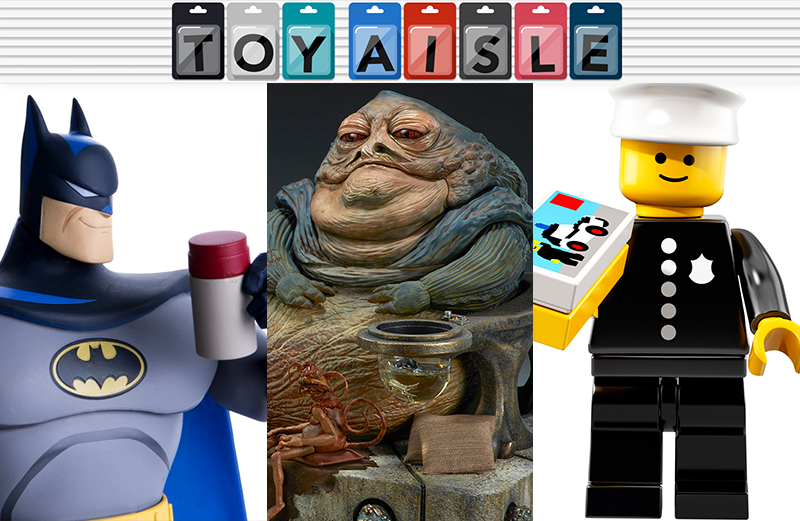 This week, we’ve got a very special Lego minifigure, almost comically deadly darts, and a Jabba worthy of any great Hutt’s display cabinet. Come take a look! Not only does 2018 mark Lego’s 60th anniversary, it’s also the 40th anniversary of the toymaker’s iconic minifigures, which have become increasingly collectible in recent years. Part of their surge in popularity has been Lego’s blind-bagged minifigure collections. Series 18 will be available starting on April 1 for $4 each, and will include new figures like dragon suit guy, firework guy, elephant costume girl, Lego brick suit guy, Lego brick suit girl, cactus girl, party clown, cake guy, unicorn guy, flower pot girl, birthday party girl, birthday party boy, spider suit boy, cowboy costume guy, race car guy, and cat costume girl. Also included in the collection is a reproduction of the very first Lego minifigure, the 1978 police officer, who’s carrying a miniature boxed replica of the set he originally came with. Not surprisingly, the police minifigure will be the rarest of Series 18, so make sure to familiarize yourself with a feel guide before you go hunting for him. At almost 30 inches in length, Sideshow Collectibles’ new Jabba the Hutt is easily the largest sixth-scale figure you can blow $795 on when it’s available later this year. Articulation isn’t its flagship feature, since the figure mostly just lays about like Jabba does, but it does include swappable arms, three sets of eyes, a moving mouth with a hidden tongue, and a tiny, articulated version of Salacious Crumb. If you’re a big fan of Jabba, this is the collectible you were destined to spend a large chunk of cash on, but can someone explain why actor Titus Welliver was roped in for its unveiling video? We’ll just chock it up to yet another thing we’ll never understand about Lost. Like a fine wine, or marshmallow Peeps left open on the counter to get stale and chewy, Batman: The Animated Series only gets better with time. As kids who grew up watching the series every day after school who’ve become adults with poor budgeting skills, we’re very happy to see a new wave of Batman: TAS collectibles hitting the market—particularly when they’re as spectacular as Mondo’s new sixth-scale figure featuring 30 points of articulation, swappable heads and hands, batcessories, and a display stand. With a $125 price tag, it’s best to think of this as less of a toy, and more of an investment in how awesome your desk will look. Is regular Jenga not stressful enough for you? What if, instead of playing on a sturdy table, you had to reassemble that stack of blocks with one hand, while supporting it with the other? That’s the basic, panic-inducing premise of Jenga Pass Challenge which requires players to remain calm as they extract and re-stack pieces. It’s available now for $20, and plays similar to the original, although with a shorter stack to wrangle. The extra challenge of passing the tower around brings a fun new angle to the game, although when it finally collapses in your hands, you’ll have no one to blame but yourself. It’s hard to pinpoint what exactly is so satisfying about throwing a pointy projectile at a board and having it stick, but that feeling will undoubtedly be six times more intense with these multi-pointed darts you can throw like Shuriken. Aside from helping you live out your ninja fantasies, these darts will also greatly increase your chances of getting one to stick to a dartboard if you’re a novice player, though hitting the bullseye will still take some practice. A three-pack will set you back $21, but they’re only available with plastic safety tips, which work best on electronic dartboards.